The view (click to enlarge). This year, I'm super fortunate to be a trip leader for Room With a View trips. These trips are morale or boondoggle trips. In theory, anyone can go, but usually they are for people whose jobs don't get them out of town. For some, this will be one of the more memorable events of their season. A Haglund to get to the snowmobiles. Room With a View trips leave after lunch and start with an hour of prep. After getting everything ready, we'll pile into a Haglund and ride over to the Scott Base transition where we transfer to snowmobiles. After we get over there, we just hop on snowmobiles and snow machine nine miles up the peninsula to the base of Mt. Erebus. It takes about an hour to get up there, depending on the quality of the snow and number of stops for pictures. I think this is the biggest treat about the trip. You aren't working. 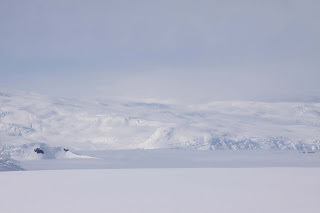 You are riding snow machines and you are simply out of town and outside in Antarctica. On the way up, you get to see old features from new vantage points, like Castle Rock. 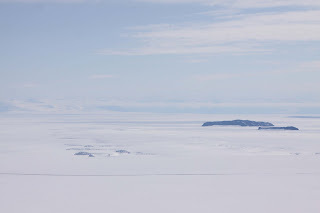 The Dellbridge Islands on the right, the wiggly part on the left is the Erebus Ice Tongue. One of the coolest things that I got to see was the Erebus Ice Tongue. It is hard to see in this picture, but if you look closely at the left third, you can see a wiggle heading out to the sea ice. This is where the Erebus glacier hits the sea ice and extends out faster than the normal glacier moves. All in all, it is just a great way to spend an afternoon. Unfortunately, we haven't been able to start leading trips because the weather has canceled all of the trips so far. My favorite part of the view. the mango tea was mailed off on monday/tuesday (i forgot which) so please look for it to arrive in the south pole shortly (weather permitting). i am in the middle of writing you a detailed letter with instructions re: 2009 & 2010. :-) will email it to you by end of tomorrow before i head out of town for business again. the new year is a very hectic & stressful time for me. how i would love to be NOT working, dealing with house purchase, and just plain being in rooms without a view. enjoy your room with a view, trip leader!